So I've been thinking about Halloween cards and came across this software program called Ecard Wizard. I checked it out and then decided to purchase it. The software program has lots of templates to choose from if you need to make a quick card and it's really easy to use. It also has lots of images so you can create your own custom cards. You can also create a pdf of the card you designed so that you can save it for future use. You can email a card as well. 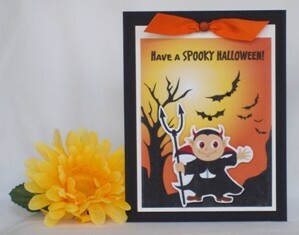 I like to take the background from the templates and then use one of the images from the program and adhere it with foam tape onto the background image, which is how I created the Halloween card above. I think the cards turn out best if you print them on a color laser printer but since there different brands and styles of ink jet printers, yours might be just fine. I also like the program because I can create custom sentiments from it. For this invitation idea, I used Ecard Wizard to create a thin circle line and then I typed 40 inside the circle. I then punched it out using my scallop circle punch. I also typed "You Are Invited!" using the software program. 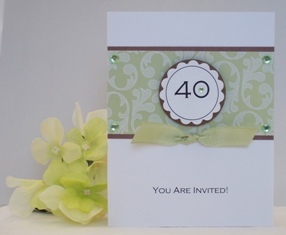 If you need an invitation for a 50th birthday party, use Ecard Wizard to print a 50 instead of a 40. This design would also make a great birthday card. 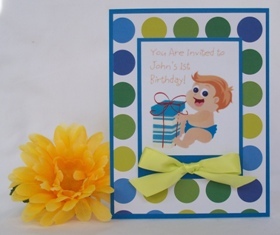 I also used the software program to create this 1st birthday party invitation. For this card idea, I took one of the images and added my own text using the program. I then cut out the image along with the text and placed it over blue paper so the blue paper created a border. Since you can create your own text using Ecard Wizard, you can customize it and put the birthday boy or girl's name on it. The software program also has images for Mother's Day, Father's Day, Valentines Day and other occassions so you have lots of options. 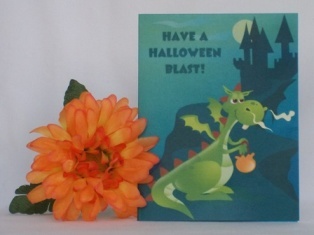 Here's a Halloween card where I just used a ready-made template to print out the card. The process was fun and easy. I do think the card size is small, depending on which fold you choose but that might be standard for most card making software programs. That's why I like to use the templates and then I cut it out and put it on a large blank card. This process makes it look more handmade and you have the opportunity to embellish it. I only have an old Hallmark software program but I don't find myself using it much. Aside for my Hallmark and Ecard Wizard programs, I really haven't tried any other card making software programs yet but email me if you have a software program you really like and why you like it so I can check it out. I'll be making more cards using Ecard Wizard so please come back to visit this site. 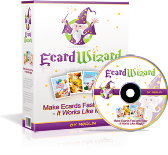 You can click one of the links above if you are interested in buying Ecard Wizard. This is one I have fun using. There are lots of templates to choose from or create your own cards like I did. and images of finished cards and you can download it right away.